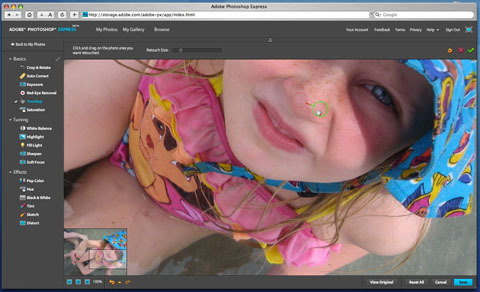 Photographers can store, edit and share their pictures using new online-based software launched today on a free-to-use trial basis by Adobe. ?Photoshop Express has taken much of Adobe?s best image editing technology and made it simple and accessible to a new online audience,? claims the firm in a press statement. The software allows user to store up to 2GB of image data online and edit their images while preserving the original versions, adds the company. However, as this initial test version is intended for use by US residents, UK-based photographers may experience ?slow performance?, warns Adobe. ?In a few easy clicks Photoshop Express empowers anyone to make standard edits, such as removing blemishes and red-eye, converting to b&w, cropping and resizing and much more.? During this stage of the software?s development Adobe is seeking user feedback on product features and functionality before the final version is released.